Young and good-looking, “Hussar”. His nickname is “Fusao”. Fusao is a so-called, “coward”. He cannot come out from his house if a stranger is around. He cannot walk once he sees someone he doesn’t know during his walk time. Even if I hold him, he panics when unfamiliar people come near him. But, no matter how panicked he gets, he never bites. And once he gets to know the person, he loves to get spoiled. He likes to be petted. 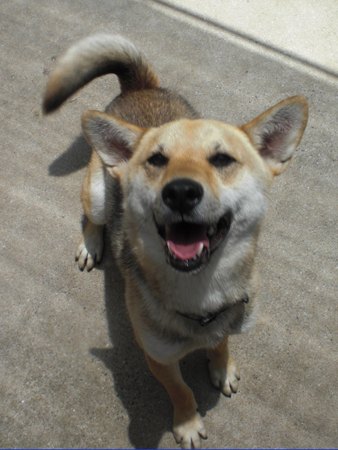 He shows his smile a lot during the walk. He could not walk in the area he did not know when he came to ARK. But now, he can walk anywhere if no unfamiliar people or cars are around. When I try to shorten the walk due to time constraints, he shows “No-No”. He also likes toys: He will go and get it if you throw his favorite one. 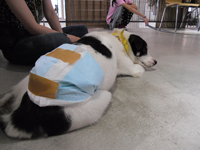 ・He doesn’t got to the bathroom in his kennel. He can wait until the walk. Fusao is this kind of boy. Probably, it will not be easy for him to live in a city. 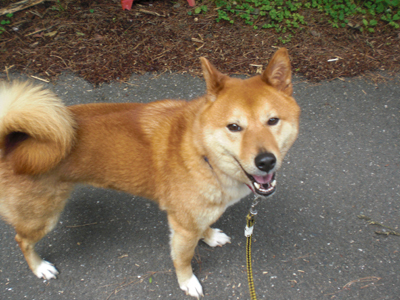 But in the countryside like ARK’s area, or with the family who has a big garden where he can run around instead of a walk outside, Fusao can live happily. He loves running too! 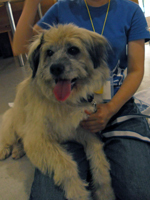 And more than anything, we would like to find a family who can be patient with Fusao until he gets used to the new life. Once he gets familiar with the person, he becomes friendly. 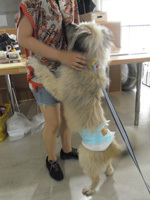 He is popular among our regular staff. 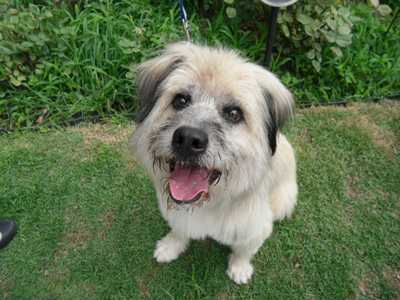 We are looking forward to finding his future family sometime soon!! 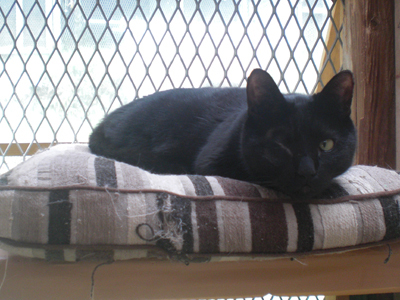 ★ If you cannot have him as part of your family but like him a lot, would you like to consider becoming a sponsor? There is no ARK shelter in Tokyo. 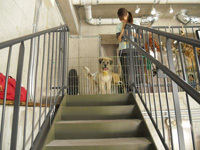 So Tokyo ARK asks foster families to keep our animals temporarily. 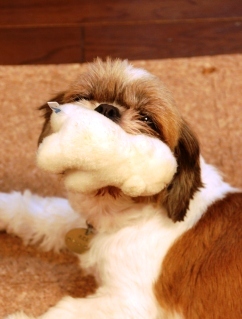 Today, we share the diary from the foster family of Shih Tzu, Sazak! Sazak had been busy, but could finally relax today. She already became good friends with our children and our two dogs. The three dogs always hang out together. Each of them has their own way to relax. 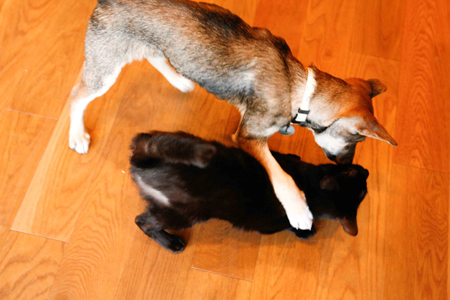 Fostered kitten, Karla, is curious but still a bit afraid of the newcomer Sazak at the same time. Sazak lies down in sight of Karla. It seems like she is quietly waiting for Karla to get used to her. In the evening, she runs in the garden and then watches the passersby at the entrance. 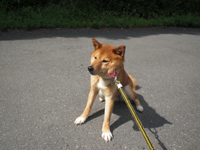 She seems to love being outside♪ She did not want to come inside of the house. And she wagged her tail whenever somebody came on the doorstep. We went on a patrol-walk with Shelly (our dog) and Sazak as my daughter returned home from school. Elementary students surrounded the two dogs, but Sazak quietly let them stroke her. She greeted them without fear when she was surrounded. She often follows our kids or watches them at home. She also gets along well with a cat! Our cat came to play with Sazak’s tail. She did not pay any attention and let the cat play with her tail. She found a toy rope somewhere in the room and started chewing it… She likes playing with toys too. 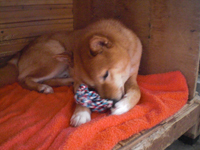 Kurumi (also adopted from ARK) took Sazak’s toy. 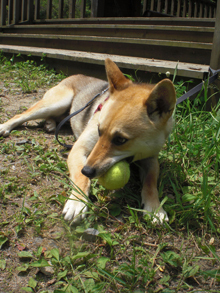 Kurumi watched Sazak play with the toy. When Kurumi got bored she left it and Sazak took it again. We take a shower with the dogs（＾◇＾）. Sazak’s needed a bath a week after she came to our house. During the shower, she waged her tail. And while we bathed her she calmly looked around the tub. She was really happy when we dried her with the towel. She was really friendly after that. It seems she completely relaxed, and we became much closer. … And then, Sazak’s posture these days is…”lean on people”. Recently she really loves to lean on us in this very relaxed way. She looks very comfortable! This one is the best! Because it doesn’t move! Oh, you like it too? She found a toy and had a huge smile on her face! Looking at the camera and still smiling!! 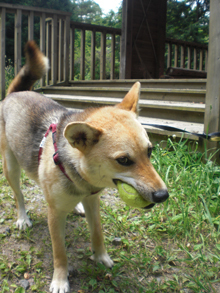 You cannot see it from a picture, but she showed the toy to us and wagged her tail. It is a great opportunity for the animals to spend time with foster families as it will be almost same as the life with adopters. 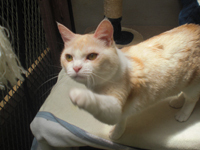 We can easily recommend the animals once fostered. 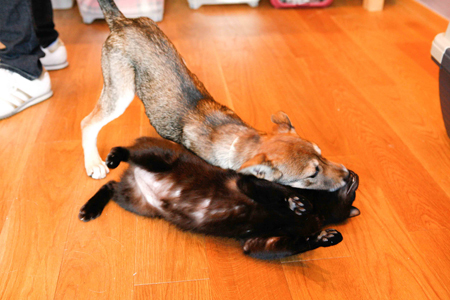 And more than that, the animals become calmer and more playful than when they are in the shelter. We cannot say thank you enough to the foster families. 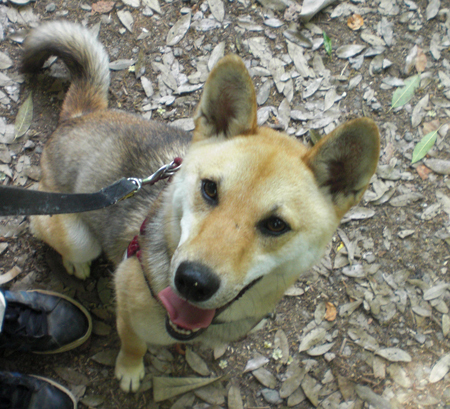 If you are interested in fostering, please contact Tokyo ARK. Didn’t you leave for the big city, Po-chan? Did you come back to Osaka? Ah, sorry you are the newcomer, Lamp, with a single eye! Just after you came in, you let us hold you. You were so popular among the clinic staff members. The room where Lamp will stay is, yes, this room. The roommates are different now. So let us introduce the current members! Nana, be nice to Lamp! 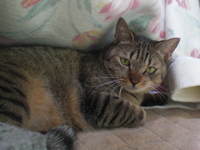 Conan is shy to people, but he is used to having a new cat with him. Blanc looks pouty because of the newcomer. 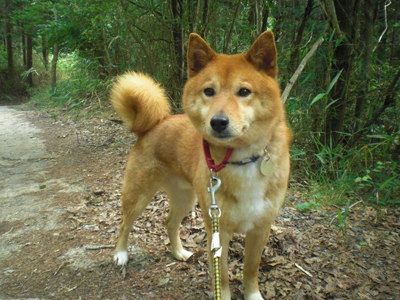 Actually, he was just rehomed to Tokyo!! Bright Blanc has adjusted to life in the new home so quickly. He plays with toys and climbs up the shelves as if he is not blind. 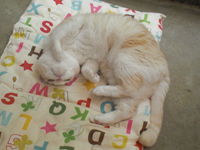 We really appreciate the adopter who chose Blanc. Cats with disabilities live in this room. 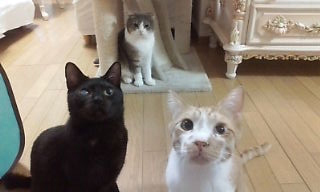 Some cats in this room have been rehomed these days. One of the reasons is their wonderful character, but the other reason is because more people are learning about adopting handicapped animals. 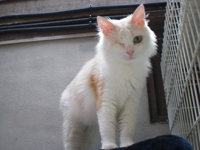 In England, where animal welfare is more advanced, handicapped animals tend to be adopted quickly. 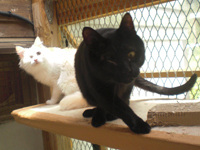 We hope that our handicapped animals being adopted is a sign that things are changing here. Great chances will come for Nana, Conan and Ren soon with the magic of Lamp? 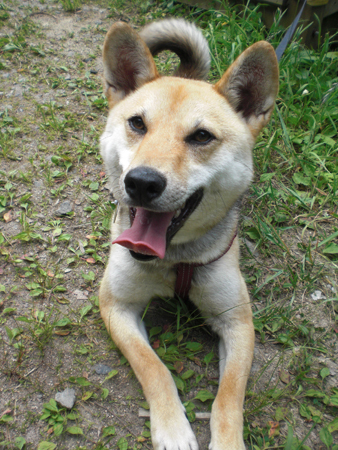 Good luck on looking for the adopter in Tokyo, Hikaru and Po-chan!! 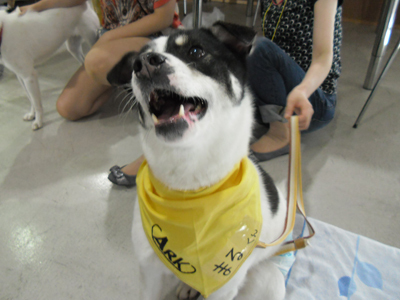 We had an adoption event at George OSAKA (JP only) on 17th of June (Sun). 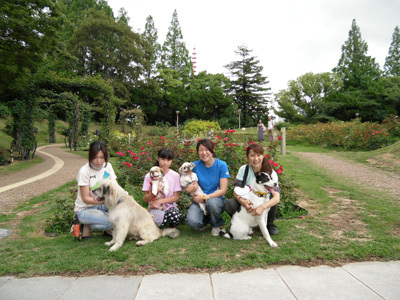 We arrived there early and went to Utsubo Park for a walk. 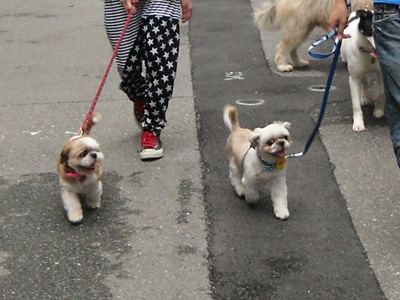 Frum and Satton are senior dogs, but they walked briskly. We posed with some beautiful roses in bloom. 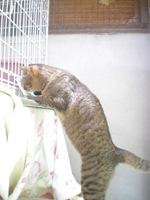 Maru is a shy boy, but he could not take his eyes off staff member’s lunch box. He could walk well in a busy city. Time to graduate from ARK? 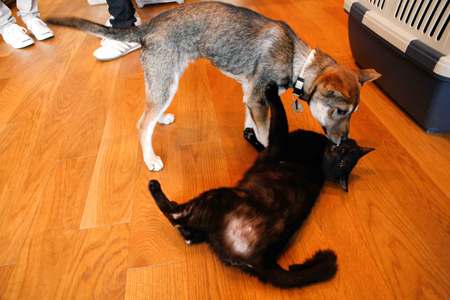 But this was a great chance to see our dogs/cats behavior. Frum has never been shy and he always goes his way. Whenever visitors came in, he welcomed them. Whenever someone got a treat, he would come too. And whenever a kitten meowed, he would come to check. He was doing everything on his own. 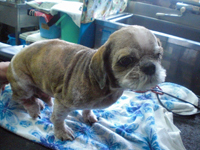 Shampoos and medical treatment gave him beautiful fur. He is ready to be welcomed to a new family! Satton came from the same home as Frum. He is a bit shy, but he loves to be spoiled. We often found him behind the curtain. Everyone tried to get him back out, “no service there, Satton!”. You will know how good they are if you meet them…! 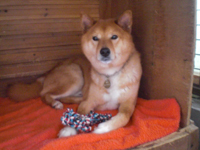 Since he came to ARK, he has been living in a back kennel. But recently, he moved to the front kennel. Meat greeted every visitor and climbed up to the visitor’s laps. He was so busy until the end! He was not upset when someone took his toy while he was playing with it. He was also calm while being held. 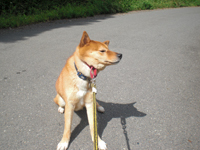 (well, a bit heavy though..) Sorry, we did not notice that you are such a lovely dog to recommend to the future adopters. This was the best thing we found out at the event! How many times have you joined the adoption event? Maru was mostly in the center during the event. Probably because not many visitors came this time. He seemed uncomfortable around the cheerful, Meat. Maru was upset just seeing Meat. 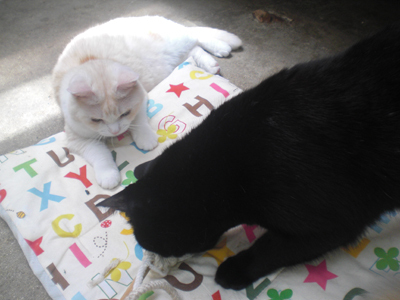 However, he came to the visitors for some treats, spoke on the command “Speak!” and played with a blanket. He was completely relaxed after a while. 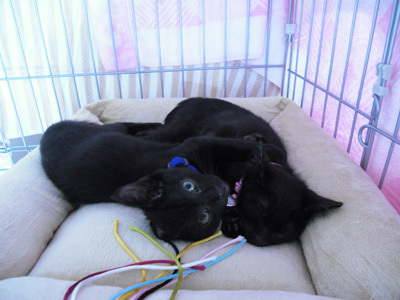 The most popular pair that day was the brother and sister kitten team. 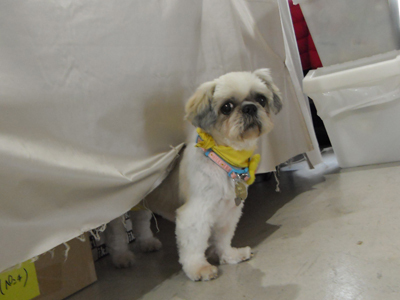 We were a little worried about Suzunari who we thought was very timid. But once they got into the cage, they never stopped playing! We could not take their picture!! This is the one we finally took. They played a lot and got tired and then slept.. 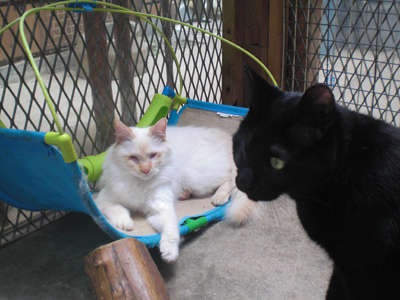 Seeing these two playing happily together, we felt that kittens will be better off if adopted together. 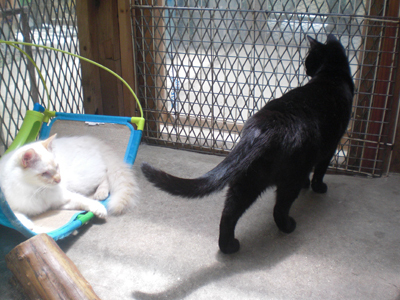 Not many visitors came, but about 3 families may become future adopters. Some came to ARK after the event that day. Thank you very very much! It’s not easy to come to Nose and we appreciate their interest in ARK… We hope an adoption event will be a chance for people to get to know ARK. We really appreciate Gorge OSAKA who always kindly lets us use the place. And thanks to volunteers and supporters. Thank you very much for your support this time too! 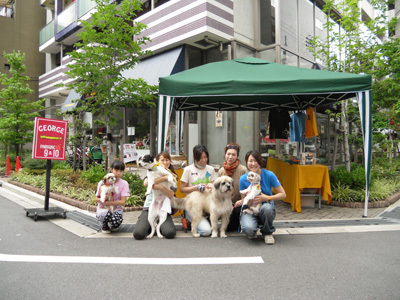 Next adoption event will be held at GREENDOG Kobe on 22nd of July (Sun). Please come and stop by! 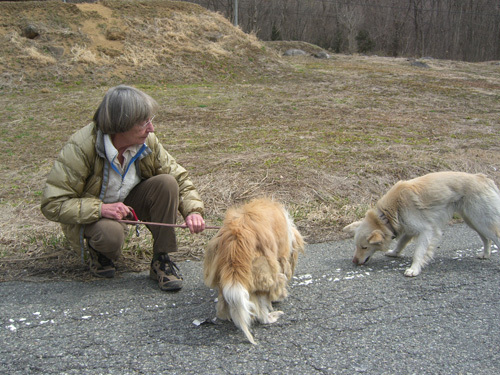 ARK is proud to announce that Elizabeth Oliver has been awarded an MBE in the 2012 Birthday Honours List, by Her Majesty Queen Elizabeth, in recognition of her services to animal welfare and civil society in Japan. The Honours List is published in the London Gazette and other UK national newspapers. MBE stands for Member of the Most Excellent Order of the British Empire [wikipedia] and is awarded to individuals by the Queen for their service to the country and community. The investiture ceremony is expected to take place in the autumn. I am indeed honoured by this award from the Queen. But it is an award to be shared by all of you who have supported ARK over the past 20 years; our members, donors, sponsors, volunteers and our hard-working staff who take care of the animals on a daily basis. Thank you all. And last but not least a tribute to the animals who have enriched our lives, with their love and trust in us. 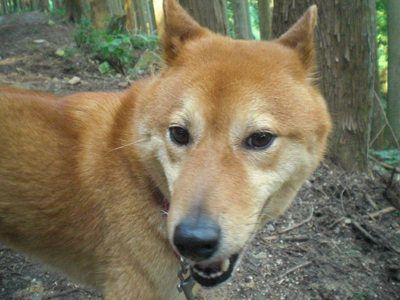 I hope that animal welfare in Japan will continue to expand for the benefit of animals for many more years to come. Hikaru and Po-chan have a reputation for being playful and generous. They came to Tokyo to look for their happiness! They already joined an adoption event and they were relaxed there as expected. 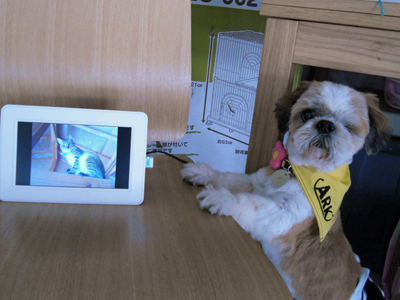 They played happily with a puppy,Tabasco, who came to Tokyo with them. 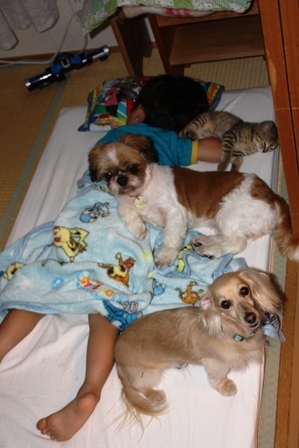 As I told you in the blog, Hikaru and Po-chan also love to hang out with dogs! Sometimes dogs are overwhelmed by them. 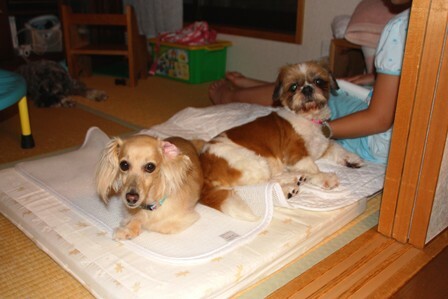 We recommend these two to people who live with dogs or to people who want to have a cat for the first time. 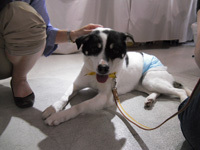 The Next adoption event is in July. 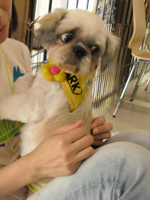 If you want to meet them before then, please contact a href="http://www.arkbark.net/?q=en/node/75" target="_blank" title="Tokyo ARK">Tokyo ARK. They are fostered by Polo’s family now. 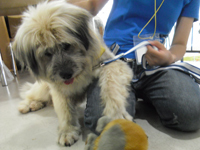 Polo was also rehomed from Osaka ARK. The more a href="http://www.arkbark.net/?q=en/node/4220" target="_blank" title="foster families">foster families we have, the more chances ARK animals can get. 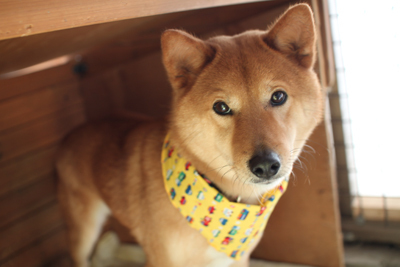 Please feel free to contact Tokyo ARK! Of course, Hikaru also played with Tabasco in the office. How ya doin’? Me? I’m great! You know, it’s been 6months since I moved to Osaka from Fukushima. I can speak Osaka dialect now! I don’t pull on the leash during the walk. Honestly, I wanna play with other dogs. But, I never played with dogs when I was a puppy. I am still being socialized. I am not used to being around them. 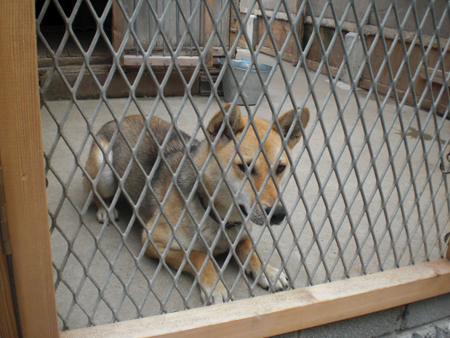 11 dogs were transferred from Fukushima hokensho (animal control center) 6 months ago. Six dogs are still living in ARK. 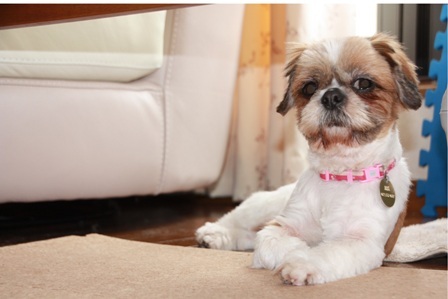 Probably due to a lack of socialization during puppyhood, most of them do not get along well with other dogs. But they love people. There are still many animals waiting for new families though people are becoming less interested in the dogs from the affected areas. We really hope that they can have a family life again. 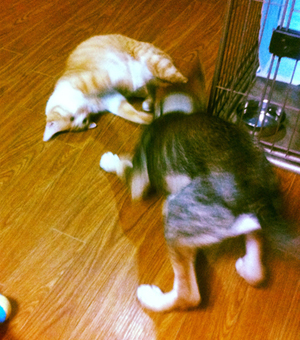 Good corporation on breaking a kennel by Axel and Jeeyu. Look at their cute butts! Both are looking for their new homes too!